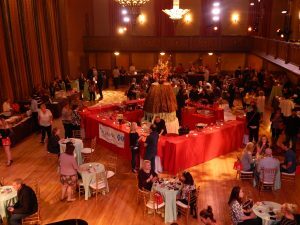 United Neighborhood Center of Northeastern Pennsylvania’s (UNC) 13th Annual Chocoholic Frolic had another successful year. Attendees were able to sample tasty treats from a 12 vendors, combining a variety of foods, flavors, and textures. The sweet and savory combinations were a particular crowd-pleaser. The proceeds of the event raised funds for UNC’s free adult literacy and English as a Second Language education programs. The sweet success comes from the sponsors: Entercom Communication, Grimm Construction, Lamar Advertising, WNEP-TV, PNC Bank, Highmark Blue Cross Blue Shield, AmeriHealth Caritas Northeast, and the Times Tribune, as well as our generous vendors: Babby Cakes Bakery, Barbour’s Bakery, Café Sevda, Carmen’s 2.0 Restaurant, Eden-A-Vegan Café, Edible Arrangements, The Epicurean Delight Catering, Gertrude Hawk Chocolates, Lynn Sandy’s Bakery, Manning’s Ice Cream, Pittston Popcorn Company, and Wegmans. Many thanks to all the chocoholics who came to frolic!